I was first drawn to this band by learning of the origins of their name, obvious from the cover of their first album, One Did, released back in 2014. Any band that names themselves after Hull’s third most famous son*, John Prescott, Tony Blair’s enforcer from another age it seems now, and describes themselves with collective tongue firmly in cheek as “verging (on) a supergroup”, are obviously not lacking self awareness or a sense of humour. Opening track Five Thing is a mash up of austere Gang of Four funk and Shadows twang, and it will make you twitch involuntarily as it pops and swaggers along. No false equivalence, but this is like wearing the most comfortable cashmere sweater you’ve ever felt orgasmically caressing your gnarly pock-marked body, in 40°C heat. You know you should take it off, the sweat will ruin it, but it just feels ssssoooo nnniiiccce. The bass of Kev Hopper, of Stump infamy, goes ‘Sppprroing’ and occasionally ‘Ping!’, and on Pluto it slithers around like a mahoosive sandworm on the lookout for lunch. Later in the track an unmanned probe lands on the depressing demoted ex-planet, finds sod all, turns tail and buggers off. Meanwhile Hank… sorry Keith Moliné (Pere Ubu) does the waltz with a floor standing lampshade in the corner, lost in reverie. And so she blows, so she blows. This is another universe that sounds fine and dandy to me, oh yes. Rhodri Marsden’s (Scritti Politti) Gallic keyboards on Seven Leggings puts me in mind of Paris in the rain, as Kev’s elbows and knees bend and flex in ways they really shouldn’t. This is lounge music for folk whose three piece suite consists of mismatched garden furniture. Clever arrangements and general strangeitude lend much of this album a surreal quality, as if you haven’t already guessed, eh? This is shopping mall music where all the shops are run by the extended family and descendants of Pressed Rat & Warthog, dog legs and feet still a speciality. Strange wobbles and time signature twists abound in Gone Jewish, but there are no atonal apples here, it’s all remarkably melodic, almost despite itself. Klezmer with double joints. Cis 3 Hex witnesses Kev’s bass blowing raspberries, and as the keyboards plink and fizz, occasional reverbed guitar attempts to steal the shaving mirror, but the rest of the band are not worried, they know exactly where to apply the blade, purely on instinct. It’s time to mention the improbably named Frank Byng (This Is Not This Heat) on the stripped down drum kit, for his never obtrusive work has embellished the already firmly nailed beat throughout Thing Or Two with a subtle eye for detail that never gets in the way, but enhances the twitching jerkiness of his fellow travellers with aplomb. This can be heard no better than on Waddlelegs. Oh, look! There’s a seven minute track at the end. That’s almost prog length, is it not? 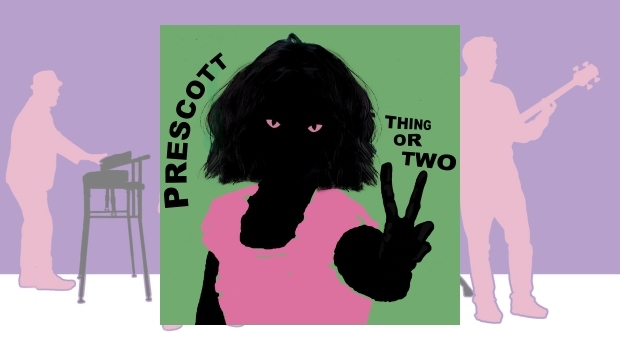 Fear not, for there are no extended flights of instrumental fancy, merely another excursion into hypnotic repetition and the tightly syncopated world of Prescott, a strange band for strange times. I think I’ve dislocated my thumbs…oh no, hang on, I’ve just remembered that they are both double jointed (fact)…phew!